You may have spent a few dark and lonely nights in Zafehouse: Diaries, desperately trying to keep your band of dishevelled survivors alive against the odds. Until now, it's been hard to know just how well you might be doing, in comparison to other players. It also shows the lifetime percentages for a number of dilemma decisions. Curious as to how many people have fought the super zombie? Or locked a survivor away in a room full of zombies? Well, now you can find out. The page updates once per hour, at which stage it will randomly select four dilemma percentages to show, so, make sure to pay it a few visits to see all the stats! We'll continue to add or change the statistics shown over time, but for now, it should give you some insight into how others are braving the unrelenting deadliness that is Zafehouse: Diaries. those numbers are pretty shocking and should give you an idea of how ridicilously hard your game is. Look at it! 500k zombies killed, according to my experience on a successful game I kill roughly 300-500 zombies. On bad games maybe 100. So let's say your average player kills 300 zombies. And the stats say 40 wins total (14 chopper and 26 car). That means that out of ~1600 games there are only 40 wins. The player will only manage to win 2% of the time. No wonder every single person I talked to says it's too hard. Not just hard, but TOO hard. As in frustratingly hard and the numbers prove it. Hey, I am amazed too at those 500k kills, but for different reasons : since steam release, that number has been multiplied by 10. Zafehouse Steam release is apparently rather succesful. I doubt it. People may try the mode too, but in the end with no goal, and a slow start the other modes are surely extremely more popular. Since they will get replayed over and over again to make it through. But even if, say the Freemode (easy) gets played just as much as the other 2 (which I highly doubt) then that number is still ridicilous. So instead of 2% it might be 3.1% managing to win! Any chance of a survivors killed to zombies killed ratio . 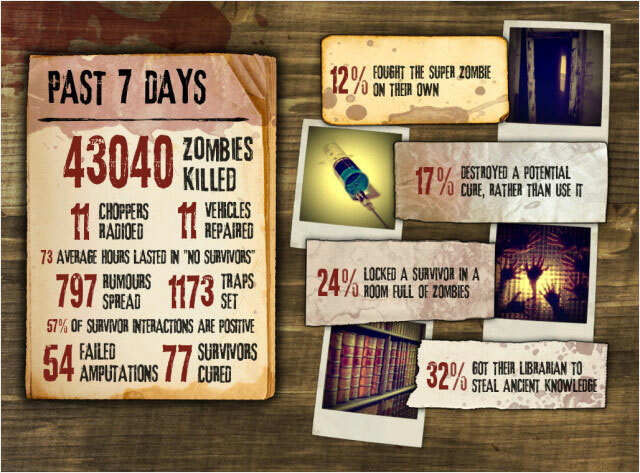 Or just a survivors lost count, tally that with the zombie killed number and there you have it! It'd be interesting to see!